Take a moment to think about the sites you’ve visited today. Have any of them stood out to you as being unique in their design? If I had to put money on it, I’d guess not. Almost every single agency hero + about section ever created (NoVolume). It seems as though the entire web/UX design industry has completely given up on actually designing new experiences. And this extends beyond the agency website paradigm. Ecommerce, social media, product pages, marketing landing pages, blogs, business directory websites, portfolios, personal sites, message boards, and even video sharing platforms are all conforming to the standard layouts prevalent in each industry. This may be startling news to many budding young designers out there, but it’d seem that the fate of innovation in web design is in your hands. What will you do with all of that power? With the design industry coming to a massive, industry-wide slowdown, what use is there in pursuing design? Why not develop universal wireframes for each industry, and simply stick to customizing the color schemes without any regard for UX innovation? After all, there’s a reason that sites are beginning to look more and more like each other. It’s because the layout that I jokingly referred to above as being “every agency site on planet earth” is actually a usable design that requires little cognitive effort to figure out. 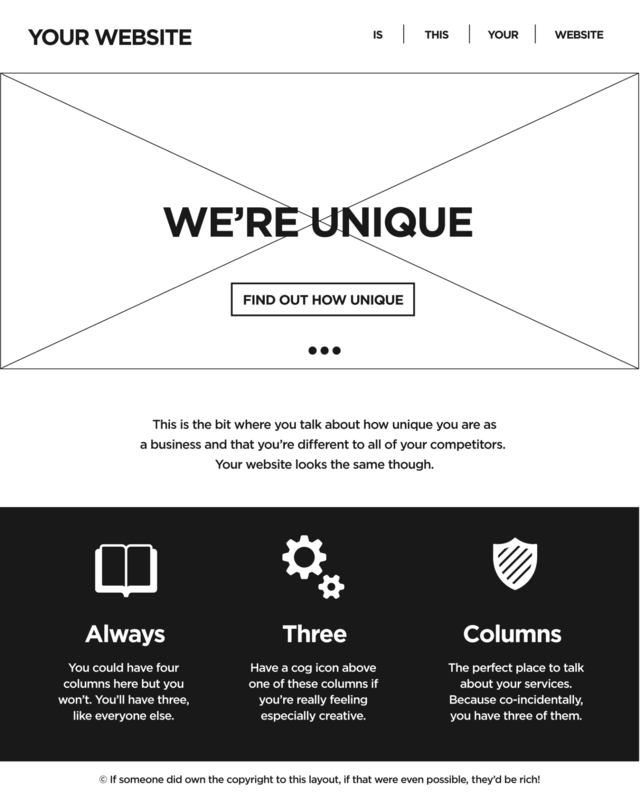 The problem is that sites like this systematically give every other designer (UX or otherwise) a bad name. Professional skateboarder Rob Dyrdek owns several pages, each of which is stunning and very innovative. They look nothing like the current standards for web design, and if a UX designer saw a wireframe for Dyrdekmachine.com, they might even faint. 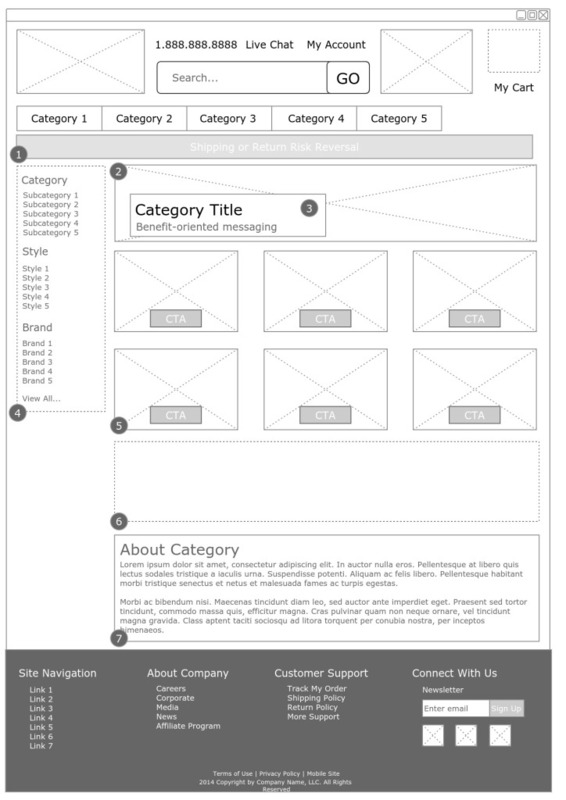 Want to learn more about creative wireframing? Read this. It looks like someone with no design experience drew it on a napkin and then gave it to a coder with a good sense of taste. So why is it such a good design? Because it doesn’t just break the mold for how a website should look and function, it shatters it. There isn’t a single industry out there that is more guilty of stagnating design than the ecommerce paradigm. How many ecommerce sites do you visit that look like this? This may be in part because of industry giants like Amazon and Newegg, who utilize the most boring, basic, overused schema ever created for the web. And I don’t blame them. Is your site making as much money as Amazon? I didn’t think so. But Amazon and Newegg are just 2 sites. We can’t blame the faults of the entire ecommerce industry on these 2 companies? Often, designers with a limited budget may not have the time or money to conduct thorough research. Because of this, cues are often taken from sites with sizable research spends, that have presumably undergone countless iterations and optimizations. Surely Amazon and Newegg fit with these presumptions. But is that enough of a reason to follow in their footsteps? UX designers would argue that the reason for the prevalence of these types of layouts is that they’re proven to be more-or-less frictionless during the conversion process. That said, it’s not the only way to do things. Unless the client tasked you with creating a “site like Amazon,” this shouldn’t be your first instinct. Otherwise, we’d all just recycle the same wireframes with only slight variations where appropriate: color, logo, font, etc. DC Shoes has, in particular, seemingly identified this trend—and rectified it. When you visit their Evan Smith lineup page, you’re greeted with a stream of product images arranged in a way that looks nothing like the traditional grid layout. If you click on an image, the page gives you an enticing, full-screen preview of the product, along with conveniently placed purchase options along the right-hand side of the window. Sadly, DC only made this design available for the top half of the page. Once you scroll far enough down, you’re confronted with a rigid product grid—no different from that of Amazon or Newegg. This isn’t an inherently poor design choice, and it makes sense to cover all your bases when rolling out a new design (especially where sales are concerned), but it’s still kind of disappointing. This hasn’t been one giant rant. This article is intended to spur some excitement and innovation in the web (and UX) design industry. There are ways to break the mold, without sacrificing conversions. Sometimes all it takes is working with the right design partner. Whether this means wowing the user with your superb animations (I’m looking at you, Rob Dyrdek), or finding a new way to get your user to engage with your content, it is doable. Do not blindly follow industry standards. Do your own research. Play around with your own innovations and your own ideas. Sometimes an idea that seems silly is all it takes to make a wave in the industry.